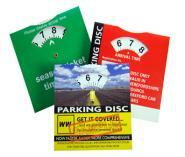 Parking disc schemes are very popular these days and a clearly visible and easy to set clock mechanism is essential. The Popupmailers.co.uk Parking Discs and Parking Permits are hard-wearing and very easy to use. They can also be used as in car promotional products if sponsored by local businesses, attracting interest from users and passers-by creating ambient car advertising opportunities. In car promotions come in a number of forms. 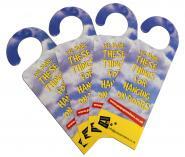 Parking hang tags are innovative and eye-catching to both the drivers and people passing by. This is why promotional automotive items such as these hangs can be used for a variety of occasions and will get noticed. We all see the “Baby on Board” signs and in a similar way the rear view mirror hanging tags attract our attention too. Car dealerships and any transport related business can make excellent use of the rear view mirror tags. If travelling in a convoy they can act like beacon markers and at festivals and outdoor events they are a perfect way to identify parking allocations. Resident parking permits and disabled parking disc schemes need to have a bold and showy case and a sturdy and easy to use clock system. The most common size we do at popupmailers is 125 x 125mm and is the size specified by the British Standard Institute for Local Government Schemes. 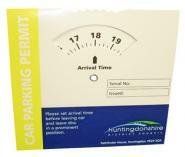 We can supply parking permits and parking discs to your required specifications, whether you need 12 or 24 hour clock or extra discs. Did you know, we also produce Recycling Wheels which are a similar design to the parking discs and we are proud to have supplied these for many Local Authorities too.